← What are the benefits of purchasing the SDK version over the basic Command Line version? 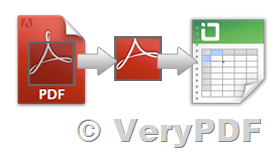 You can upload a PDF document, the conversion will start automatically. VeryPDF Online PDF to Table Converter tool can save lots of time, instead of copying-and-pasting each cell. Our algorithm can 'see' tables, and understands the spacing between items to identify the rows and columns, much as your eye does when you scan a page. You can use this tool in your browser, and this guide will walk you through the conversion. No need to leave an email or other personal information. All files are deleted from our servers after 6h max (without a trace). All data uploaded to our servers will be used for conversion purposes only and deleted promptly after conversion. Full Document Conversion. The web app converts documents of all sizes. No matter how complex your data tables are, they will be converted accurately without the need for further formatting. Exact Spreadsheet Recognition. All tables trapped in PDF will be extracted accurately. The rows and columns structure will be the same as in the original file, but fully editable and ready for reuse. Conversion speed depends on the file size, but for average size files it won't take longer than a minute. Conversion in the cloud. All our servers in the cloud are processing PDF non-stop around the clock. You don't need to install anything and we do all the work for you. Able to determine tables by manual or automatically. How to convert DOCX to PDF programmatically without Word application installed from C#? 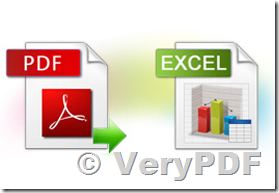 How to hide or delete print and download options from Online Document Reader (Online PDF Viewer)? 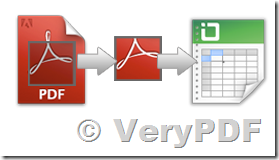 Where do we add the API key for Free Online PDF Annotator? This entry was posted in VeryPDF Cloud API, VeryPDF SDK & COM and tagged pdf to csv, PDF to Excel, pdf to table. Bookmark the permalink.